Giroro comes under attack from a cloaked power suit, which he damages. 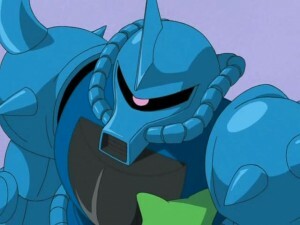 Natsumi stops him from destroying it since there are two alien kids inside. They are from Tabasawa, and are a sister and younger brother named Mulu and Oro, who are looking for a red-faced alien with a scar who defeated their father. They were put onto Giroro by Keroro to get a reward. 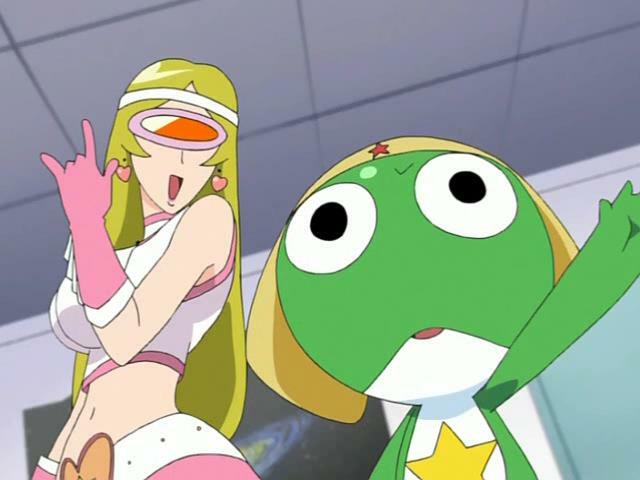 After Keroro is punished, he, Tamama, and Mois go to find this alien, named Wookie. After a few days, he shows up as Keroro is having tempura. 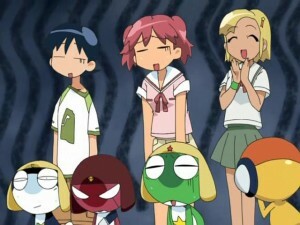 Keroro is defeated, so Mois gets support from Giroro, Mulu, and Oro. 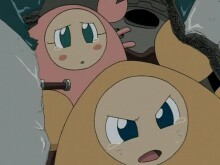 Wookie mocks the brother and sister, so Giroro, who’d been training Oro, attacks, but is beaten down. 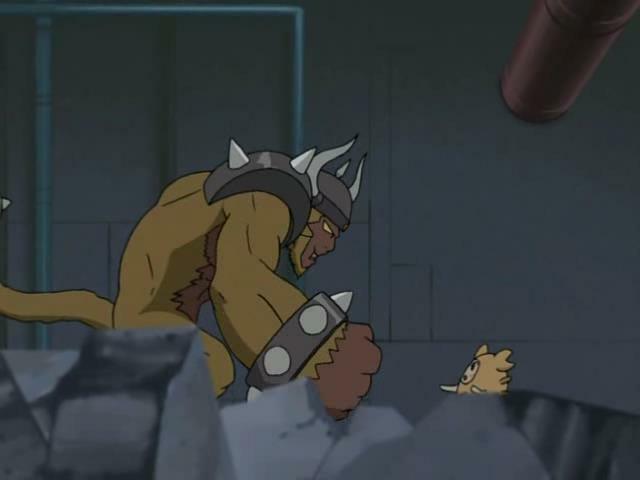 Oro takes up the fight, but battles in a rock-paper-scissors match, which is what their father lost to Wookie. 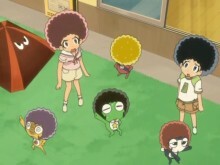 Natsumi pulls a coupon from the newspaper insert, which then summons a giant afro to Earth. 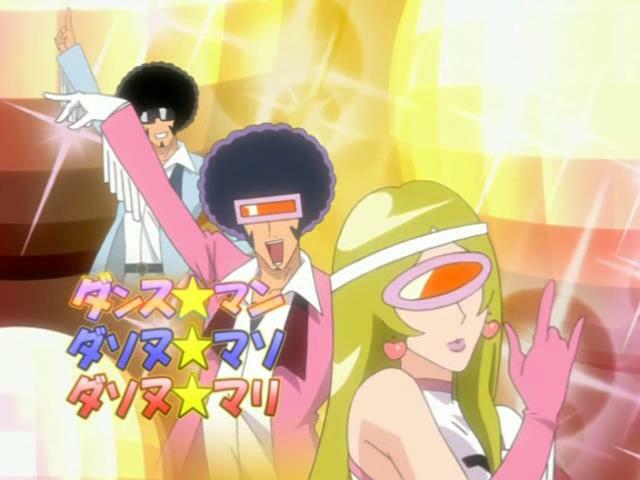 Natsumi accuses Keroro of bringing Dasonu Maso back, but a tall, blonde woman emerges, calling herself the sister of Dasonu Maso, named Dasonu Mali. She wants to join the foursome Keroro comedy troop, so Keroro agrees to bring her on to help with the invasion plans. Their first plan fails when Dororo realizes what they are up to. Their second one fails when the power of middle-aged women shopping causes a satellite to blow up. Their third plan is aborted when Fuyuki reminds Keroro that destroying Earth means no more Gunpla. Dasonu Maso arrives to see what Mali has learned, but he has to teach her more before giving everyone afros, then leaving with his sister. Two more parody-rich episodes, but not all that swift. For the first episode, I will admit that the cliched story of kids avenging their father made me think a cliched ending was in store. As such, the rock-paper-scissors thing coming out of left field like that actually ended up being amusing. Score one to the anime there. 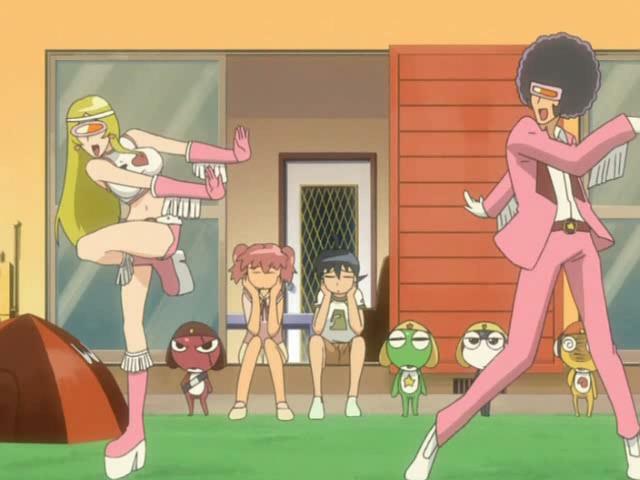 For the second story, we have the obvious parody of Dance Man, in the form of Dasonu Maso. That being said, Dasonu Mali is clearly a parody of MATSUMOTO Leiji-sensei’s overused blonde, female character design that appears in nearly all of his anime works. And speaking of Matsumoto-sensei, the reason I watched Mobile Suit Gundam was to get parody references like the one below. So while this episode may not be anything special, it did have its moments.